Dental stains can be difficult to remove with over-the-counter products. They can also make a healthy smile look unhealthy. Dr. Jose Valenzuela, Jr. provides both in-office and take-home teeth whitening treatments to help you achieve the bright smile you desire. Why should you undergo professional teeth whitening? By using a strong whitening solution, treatment can remove even stubborn stains. Our in-office treatments can provide dazzling results in a single visit. Overcoming your smile insecurities can help you feel more confident. How does in-office treatment work? Are patients typically happy with their results? Dr. Valenzuela offers Zoom Teeth Whitening, which can brighten your smile up to seven shades in just one session. Your teeth are susceptible to two kinds of stains: intrinsic and extrinsic. Intrinsic stains occur when the inner structure of the tooth, the dentin, becomes discolored due to genetic factors, trauma, or certain medications. Extrinsic, or outer stains, can be caused by certain types of food and beverages, such as coffee, tea, berries, and red wine. Smoking can also cause extrinsic stains. The Zoom® teeth whitening solution can effectively treat extrinsic stains, brightening your smile by up to eight shades in a one-hour office visit. For patients who want to undergo treatment in the comfort of their own home, we also offer take-home teeth whitening kits. Every patient's treatment timeline varies, but most can effectively and reliably brighten their teeth at home in about two weeks. Professional teeth whitening can address dental stains caused by food, drinks, and the environment. Teeth whitening is generally suitable for all patients who want to remove stains on their teeth, barring those who have very sensitive teeth. During your consultation at Cosmetic & Implant Dentistry Center, a dental hygienist will examine your teeth to check for signs of dental decay or disease, before proceeding with your whitening treatment. Since these treatments target only extrinsic stains, patients with intrinsic stains may consider other cosmetic dentistry options such as porcelain veneers, dental crowns, or LUMINEERS® to conceal discoloration. If you choose an in-office treatment, you will first undergo professional teeth cleaning to remove plaque and other substances that can hamper the whitening treatment. Next, the dental hygienist will apply the Zoom!® hydrogen peroxide-based gel to your teeth, ensuring that your lips, gums, and other soft tissues of your mouth are covered. Once your teeth whitening procedure is complete, your teeth are noticeably whiter, enhancing the overall aesthetics of your smile. 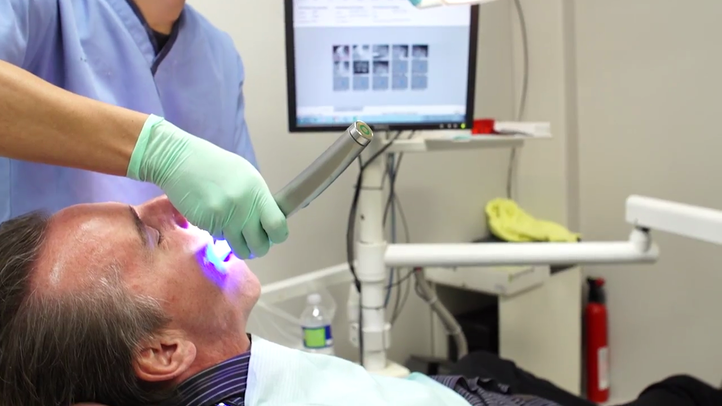 The solution is then activated using a special light, which breaks down the solution to release oxygen molecules that penetrate the tooth enamel and remove the stains. The procedure typically takes about one hour. Once your treatment is complete, your teeth are noticeably whiter, enhancing the overall aesthetics of your smile. If you choose the take-home whitening option. Dr. Valenzuela will create a set of custom whitening trays based on your dental impressions. These trays are fabricated to ensure that they fit comfortably, and that the bleaching gel does not come in contact with your gums. You will need to line the whitening trays with the whitening gel, and wear them for about 20 minutes every day. Most patients achieve their desired results in about two weeks, but it may take longer if you have stubborn stains. Teeth whitening is an easy and reliable way to boost your appearance, whether on its own or as part of a comprehensive smile makeover. To learn more about your teeth whitening options, contact us online or call us at (866) 223-6147.